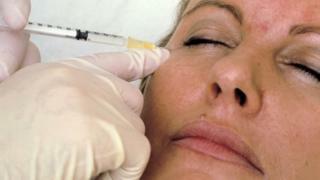 Beauticians have been banned from joining a new register designed to make getting injected with fillers safer. The voluntary register was opened by the Joint Council for Cosmetic Practitioners in April to everyone trained to a high standard. But now it will include only those with medical training, after doctors and nurses threatened to boycott it. The joint council said two beauticians had applied to be listed, alongside 20 clinicians with a further 150 pending. However, the register will continue to list beauticians for other treatments, such as laser and chemical peels. David Sines, who chairs the joint council, told BBC Radio 4’s You and Yours programme there was no way of checking whether beauticians had been adequately trained to inject fillers. “We are arguing for statutory regulation. The register was backed by the actress Lesley Ash, who was ridiculed in the press for her “trout pout” after her lips were injected with industrial fillers. She said: “I think it’s a fantastic thing that is happening now with the register. And I think a lot of it had to do with the publicity I got. Sue Ibrahim, from the British Association of Aesthetic Nurses, Doctors and Dentists, said the inclusion of beauticians for filler treatments had put the public at risk.